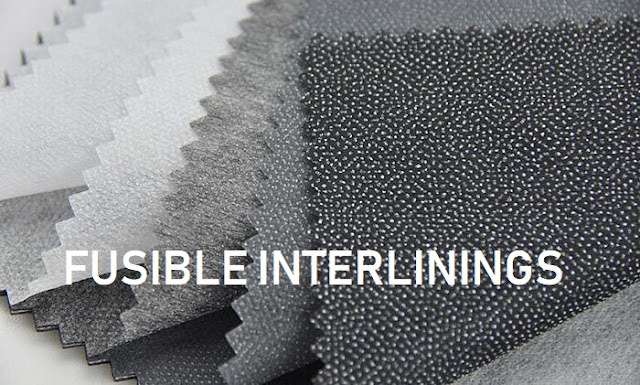 Interlining is a layer of textile used between two outer layers of shell fabric to impart strength, support, stability and shape retention to the outer shell fabric against any distortion due to stress exerted at various stages of production, during wearing/use or aftercare treatments. The interlining is also called as interfacing. The lining is a layer of textile used under the garment as cover to the raw edges and smooth surface to support outer shell for good drape. It can be woven or knits as needed for a particular application/use. For an example, in the girl’s frock, you will find white lining fabrics under the shell fabric. As said above interlining is used between two outer fabric layers. For an example, fusible interlining used in collar and cuff in men’s formal shirts for stiffening the said components. Followings are the primary objective of using interlining in garments. Interlinings are primarily used for imparting strength/support, stability and shape retention. Primarily woven interlinings were first used 100 years ago to strengthen/support coats, cloaks and gowns or hat. It was mainly 100% cotton fabrics made stiff by starch application and was non-fusible. However, the unpleasant hard touch and irregular characteristics during washing led to the development of fusible interlinings. Normal cotton sheeting fabrics were applied with a layer of adhesive that can be fixed to the shell fabric by application of heat or pressure. This formed a composite part of the fused shell part and supported the outer shell for better drape and look. Woven interlinings are majorly 100% cotton based with a thread density of variable count as required for the weight or stiffness needed for a particular use. Now poly-cotton blends are also available to overcome the problems of shrinkage faced in cotton fabrics together with a variety of warp and weft combination like rayon, texturized poly and wool etc. The main advantage of woven fabrics is its strength and stability, hence used for all such applications where strength and stability are needed like the waistband. However, this could be a disadvantage at times where flexibility and soft hand feel is required. Woven is majorly plain weaves, sometimes crepe, herringbone or twill weaves are also offered according to the application need. In such cases, texturized poly yarns are used for voluminous body, soft and natural hand feel or drape of the fused composite at the same time strength, flexibility and lightweight of the fused laminate is achieved without much altering the natural drape or texture of shell fabric. However, woven is expensive and not suitable for less expensive casual garments hence, it was replaced by knitted fabrics that used a combination of synthetic yarns with rayon and wool for body and volume according to different application intended for. The major disadvantage of woven in its flexibility, lightweight and soft handle was duly addressed by knitted fabrics. Knitted fabrics have a large number of variation in terms of loop structures to impart flexibility/stretch together with the body (volume) and strength/stability. They are kept lightweight and soft hand feel of the laminate by using fine bulked (texturized) filaments. It is expensive and hence used in high value garments like blazers and high fashion blouses. As the name implies there is no involvement of any yarn for interlacement to make the fabric. It is made directly from fiber to fabric stage in the process reducing the cost of base fabric. As there is no yarn used in making nonwovens, it lacks in strength needed for apparel use and there are many techniques applied to impart required strength to nonwoven textiles, called Bonding. They are the most versatile product available from 10gsm to 200gsm and above, offering light, soft, flexible or strong for any application one can think of. The basic manufacturing technique is using mostly synthetic fibers to form a layer, which are imparted strength by bonding. Let us understand the different layering and bonding methods, their use and their advantages and disadvantages. Different types of layering methods (spun laid, wet laid, dry/random laid, cross laid, and linear laying) are showing in the following images. Very good washability Heavy contamination of taflon belts. How to select the right interlining for my use? To help decide on the type of interlining suitable for an application, one has to evaluate exact need, purpose, the material area of application, the care instruction and processing details of the garment. The following FORMAT is suggested to be filled in and one may consult an interlining supplier to conduct a fusing test on the material, preferably on self-owned equipment in the factory and submit a test report for 5, 10 or 20 washes depending upon the brand value and price point of the garment. Bond strength values after fusing and after washes. The buyer can decide if the results and looks are acceptable or not. Appearance: no bubble or any surface unevenness after wash.
No change in hand feel making it too hard. No change in visual looks: wavy moiré effect or colour change (please refer to picture NW 10). This is due to woven interlining or linear dot print pattern used in light open texture fabrics (see picture NW). No shiny dots of glue visible on another side. Normally for very light, transparent and flimsy fabric like georgette/chiffon colour of interlining must match the base colour and not use white/black/charcoal in general. For small area usage as mentioned which are close stitched from all sides the bond value of 5-7 N per 5cm strip is enough and safe. Check glue line temp by temp. Strip Never lower /higher than given temperature. About the Author: Rajkumar Rai is a Textile Graduate from Calcutta University and alumni of Indian Institute of Foreign Trade. He has over 36 years of work experience spanning in textile processing, apparel buying house, and other areas. He was India head of Freudenberg. He was heading a buying house over 25 years and worked with German buyers. Why interlinings are used in garment? 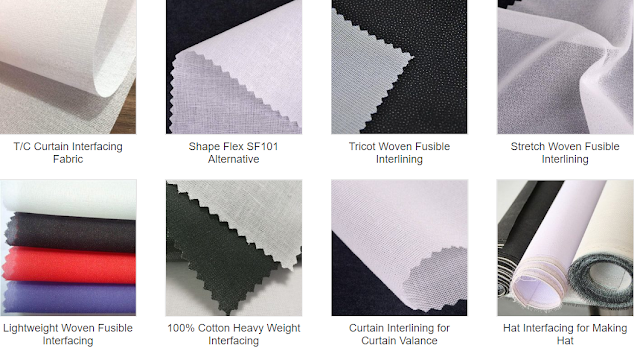 What are different types interlining available and how to select the correct interlining for your garments.